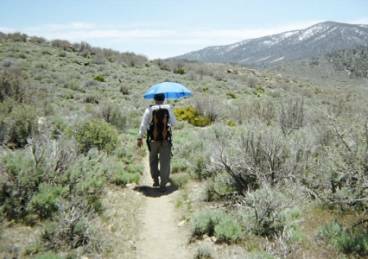 I just completed the final mile of the 2600-mile Pacific Crest Trail, a hike that took me six years and five treks to complete before my 60th birthday. Having completed the trail is a big accomplishment for me—even if few people understand it. I hardly understand the scope of it. Recently the Smithsonian magazine reminded me—fewer people have completed the entire PCT than have gotten to the summit of Mt Everest! As a young person I once dreamed of climbing Mt. Everest but age made that dream increasingly unrealistic. Now I find that I’ve done something more rare than climbing the highest mountain in the world—hiking the entire PCT. My backpacking dreams started with the Appalachian Trail. Since age 13 I had a dream to hike that 2050-mile trail. That dream became a reality in 1998 when I finished the AT. I figured I was done with backpacking and I turned to canoeing. In 1999 I canoed the entire Missouri River and wrote a guidebook for it. 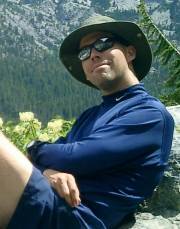 In 2000 I went solo to the PCT to “look it over” and compare it to the AT. I wound up hiking a couple hundred miles from Lake Tahoe to Mt Shasta. I liked the Western trails. 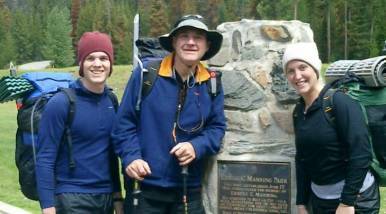 But I did not return in 2001, instead I took four students and a professor and hiked a chunk of the Colorado Trail. In 2002 I was planning to canoe to Yukon River end-to-end when student Paul Kind kept nagging me to take him on a backpacking trip instead. After a few months I relented and agreed to do a PCT hike with him if he found another student to go along and they both carried some of my food for me in exchange for my paying all their expenses. I figured that students were young strong and poor while I was old, weak and had some money. The scheme worked so well that I continued it and each year for most of the PCT and gradually finishing the entire trail became a goal for me. I never could have done it without the companionship and help of the students who went along. Carrying some of my weight slowed down the eager wanna-run students and speeded me up so I wasn’t too far behind them. But even more important than lightening my load, I’d have never covered 2600 lonely miles without their companionship. So in this posting I want to honor the people who helped me finish the PCT after that initial solo hike in 2000. 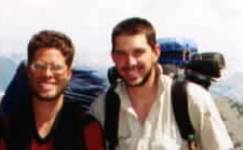 These two Religion majors at IWU joined me for 550 miles of hiking in 2002—from the Mojave Desert north to Lake Tahoe. Marcelo filled all 550 miles with constantly creative and interesting conversations keeping us laughing all the way to Lake Tahoe. Paul Kind got the most mentoring from me of any hiker—asking all the right questions and digging out answers in long and in-depth conversations along the trail. Both these guys liked to sleep in, so I often could get a few hours up the trial before they even woke up in the morning. On this hike we did our first 30-mile day on the trail. Where they are now: Marcelo is a youth pastor in Grant Michigan and Paul just finished a yearlong around-the-world trek and is about to take his first full time job in a church. Melissa “Rudy” Ruder was the first girl to join me hiking along with Mark Schmerse. “Rudy” hiked 700 miles from Canada to Sisters Oregon before leaving the trail for a wedding. Rudy was a delightful person on the trail, adapting to it every bit as much as any guy ever and carried her weight (and mine) as easily as any guy ever had—she opened the door for other female students in the future. Always chatting with either Mark or me, she brought a lively spirit to the hard work of slugging through endless miles of snow in the Northern Cascades. Mark is the consummate hiking companion, always smiling and pleasant. Until I took this hike with Mark, the single-hike record for hiking with me was held by my wife Sharon (who hiked 1050 continuous miles of the Appalachian Trail with me in 1972). 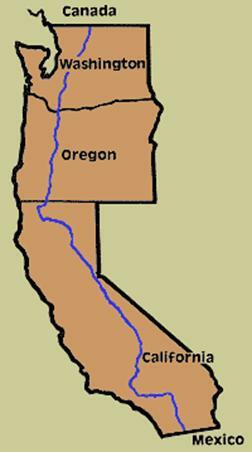 Mark edged her out by 100 miles, hiking a full 1150 miles through Washington, Oregon to California’s Mt Shasta with me. We talked long hours about life, the church, theology, ministry, marriage and just about every other subject during our two-month trek. Mark is like e third son to me Where they are now: Rudy has subsequently finished her masters degree at John Brown University and is now is playing professional soccer in Denver Colorado. Mark just finished a year-long around-the-world trek (with Paul Kind) and is getting married this weekend and will be hiking the John Muir Trail in June with his new wife, Jess Dvorak. 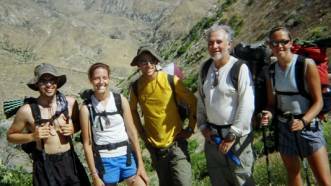 Then they will be serving on the pastoral staff at Heritage Wesleyan Church in Moline, Illinois after their JMT hike. Burton Webb was a non-backpacking biology professor at IWU in April 2001 when he and I sat on a committee planning a faculty retreat (I hardly knew him). As we went around the table telling what we were doing that summer I reported hiking the Colorado Trail with some students. He piped up immediately, “Can I go?” I gave a smiling “sure” response. (People are always saying they want to go backpacking with me some time—I am used to this.) But Burt was serious. Sure enough he went along. Since then he shows up for at least a week or two on just about every hike I take. He adds charm and his biological knowledge to the trail. I always look forward to our conversations about University politics and Biology and I miss him when he leaves. Burt never carries any of my weight but he makes my load seem lighter by offering adult conversation. He joined Mark & Rudy in Washington with me for days of negotiating the snow-laden Cascades but he really belongs with many of the hikes since he often shows up for a week or so providing a great respite in most of my hikes. Where he is now: teaching biology and head of the science division at IWU. Sam Bills is an IWU graduate who was (at the time) a graduate student at Azusa Pacific University in California. He joined me for the difficult dry section from Mexico to Palm Springs in 2004. For several hundred miles Sam was my instructor. He had taken several courses from Donald Dayton at Azusa and he re-taught them all to me over these desert miles. The “trail angels” had put out water caches here and there which was fortunate—there was not a single natural water source for the entire 200-mile hike in 2003. Sam and I share a lot of interests including worship, ecclesiology, philosophy, spiritual formation, theology and we also share one good friend: John Drury. This was a dry hike physically but not mentally. Sam had hiked with me before on the Colorado Trail and had carried some of my weight then (though not on this hike) but his intellectual stimulation was more than enough to get me through this difficult part of the trail. When he left me I pushed on several days but eventually succumbed to the electrolyte imbalance so common to desert walking and drinking excessive water, collapsing on the trail to wake up the next morning only able to stagger to the next town in time to replenish sodium and potassium and prevent death. Afraid of dying, alone I went home early leaving 360 miles of the trail to finish the following year. Where he is now: Sam now attends Fuller Theological Seminary in California. I took no chances to finish the final 360 miles of the PCT—taking along 4 students for company and to help carry extra water across the Mojave desert and through the final dry section of Southern California desert. Jeff Timmer, music major was definitely the quietest man I ever hiked with. He says nothing unless he is sure it contributes something—and he must be seldom sure because I’ve head more from people in a half hour than I head from Jeff in 21 days. He was a steady hiker and often was far ahead of the rest of us. Ryan Robertson is a senior Elementary Education major. He was almost as quiet as Jeff though he would return a “yeah” to other people’s comments when they spoke and if you got him completely alone he would chat a bit. Happy smiling Ryan never got discouraged though he often got cold (seems funny, but we faced some below-freezing nights in the desert). From waking to being on the trail hiking took Ryan exactly 4 minutes—some sort of record I think. If I had done this hike with Jeff and Ryan I would not have had much conversation to help me through the desert. Luckily Kara Watson, CE major, compensated for their quietness. Kara may be the most positive person I’ve ever met, exuding enthusiasm and delight at every turn in the trail, Kara was our “expressive” supplying the verbalized emotions the rest of us were having. She a cross-country runner so when she decided to, she would out-pace every one of the group for miles. Whoever gets Kara will be a lucky church and man. Juli Neff, ) (Adolescent Ministries and CE major) was one of those students a professor almost overlooks. She was the “stealth” hiker, racking up miles with little effort day after day showing how strong she was. She defiantly has the best balance of any hiker I know— scampering across 3” logs perched above roaring rapids as if she were a cat. All four of these students carried three pounds of my gear each. Since my “dry pack” (Pack excluding food and water) weighed only 7 pounds, that meant I got to take the last 360 miles of the PCT with an empty pack on my back most of the time. Even so, I was always the last to catch up to the group on breaks. Where they are now: Jeff is applying for a job as a Resident Director at a Christian College in Florida; Ryan is working for IWU this summer supervising the “Climbing wall” and will do his student teaching next year; Kara will be working this summer with a ministry organization and is looking for permanent work in a local church; Juli starts work as a chaplain in the National Park system this summer and is still undecided on which church she may work with in October when that assignment is finished. I can’t think of that yet—I need to sleep this one off, I’m tired! In June I’m returning to the high sierras to hike them with my sons. In July I’m returning to the most dramatic part of the Appalachian Trail to hike through New Hampshire and part of Maine—the White and Mahoosic mountains ranges. But I can’t think of starting the Continental Divide Trail yet. I’ve already done a couple hundred miles of it—and it is nothing like the tamer PCT or AT. For now my goals are simpler: “Hike 500 miles a summer until I am 70.
è Did you see any poisonous snakes? Bears? Maybe 7 rattlers on the entire 2600 miles—five of them on the final hike this summer. Many more probably saw us, but even those we saw were scurrying off afraid of what we’d do to them. Snakes aren’t a problem. I saw maybe a half dozen bears total—only two up close and personal, a mother and cub. I sang to them as I retreated back down the trail. Momma bear sniffed the air and diffidently lumbered off down the hill with her cub in tow. è What was the best part of this trail? Tie: The high sierras to which I have returned every year since for a hundred or so memory-enhancing miles are tied with the Northern Cascades in Washington, which we did in heavy snow. è What was the hardest part? Loneliness—either when hiking alone or even sometimes with others. While I like solitude I do not relish loneliness. Though I usually want to hike the first 5 mile alone while meditating and praying I hate walking alone the rest of the day. The bigger the group the more I’d have to walk alone usually. But at least I always had a group to break with—except when I did some of the trail solo. è How heavy was your pack? If I had carried all my own weight—sleeping bag, food and water it would have ranged between 20 pounds (beginning of a week) down to 8 pounds (on the way into town after a week of hiking and all the food is gone with only a cup of water left). è Did you ever hurt? è Would you do it again if you knew what you know now? è Do you feel closer to God in the outdoors? Not really. I feel closer to myself though and that relates to sensing God better. If one wants to find God he does not go to the mountains…he goes to church. è Then what do you get out of it? Why do this? I do it not for what I get out of it but for what I lose... for me it is not about presence as absence... emptiness as a virtue... three weeks of backpacking empties me out. It makes me fast. I fast email, phone calls, the harried pace of living, complex decisions, complex problems and complicated relationships--I empty out almost everything. Life gets as simple as thinking about where the next water will be or when to take a break and eat a snack. I know I have “centered in” when I realize that I've been walking for several hours and not thought of a single thing. My mind has been empty. It is a magical reset button... reformatting my mind and soul for returned life. People don't get this in less than multiple weeks of hiking... but when it comes I know I have completely wound down--emptied out... Most folk imagine backpacking as "getting something" but the loss is the gain. Sure. I have some interesting and deep conversations along the trial... but that’s not the gain. The gain is the emptiness. Backpacking is a laxative for the soul. When I return, my priorities have adjusted... not because I've even thought about it or wrote anything thing down but it happens anyway-- it is like the Patriarchs or the Desert Fathers of the church... doing without is the gain. Thus I do “journaling without writing.” When I come home I’m different and Sharon likes it. è What did you learn from your treks? Besides learning to live on less I see so much hospitality. All along the trail there are “Trail Angels” who go out of their way to help hikers. Hitchhiking to town makes me feel needy—I need to feel needy. Sure enough, the poorest people always pick you up. Those who have the least share it the best. Just a few weeks ago we were in Lake Hughes, California a tiny one-store town. It was in the middle of a cold desert rainstorm. We were soaking wet and there was no place to stay in this little town. The clerk invited us to her one-room apartment where all five of spent the night after Lynn made us a huge meal. Lynn was a drug addict who is now clean after decades of living on the streets in Los Angeles. She knew what it meant to be homeless and in need of a warm place to sleep. We left with dry clothes and a good meal in out bellies. Then there is Jeff and Donna Saufley in the tiny desert town of Agua Dulce who offered her full-size mobile home behind her house as a cool place for us to sleep. More than that—when we arrived she had fresh clothes in her garage for us all to put on while she did our laundry for us—all as a matter of hospitality and for no money at all. 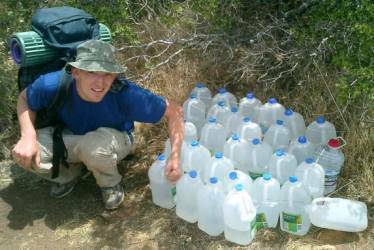 There were scores of unnamed people who secretly tote gallons of water to the trail so hikers can have a drink in the desert. There are at least a hundred faces I can picture of folk who helped me in one way or another on these hikes, some of them Christians. I was a stranger and they took me in, hungry and they fed me etc. Then there are the friends at home who sent little boxes of candy or cookies to post offices along the way. The couple in Canada I met canoeing who send a box of food to every stop on the trail since. My family, fellow professors like Dave Smith who send candy bars, or students like Abby Hontz who annually send a package, or Julie Collins who made a pile of fresh brownies and overnighted them to a tiny desert post office last week. And of course all former hiking companions always send care packages including Mark Schmerse who sent two giant Pizzas last week which we ate happily on the trail the next day! People don’t have to do these sorts of nice things and I always am amazed at the care and compassion people have. It makes me want to be more like them when I return. è How did you get your wife to let you do this sort of thing? “Let” me do it? “Let”? I didn’t ask permission. I guess the answer is that I did not marry my mother but my wife—my mother was the last person who “let” me do things. My wife is an adult and we have an adult-adult marriage where neither of us “let” the other do things. Sharon enrolls in a Ph.D., takes new jobs, buys houses and trades in her car without asking permission from me. I do similar things. It is not anything we think everybody else needs to do; it just works great for us. But your question is worthwhile—and men are always asking me this.